Look out the window of the Bridge Press Cellars winery and you can see Spokane's House of Charity. Winery owner Melody Padrta moved into the space back in 2012, knowing full well that her business was directly across from the biggest homeless shelter in the city. But last year, House of Charity became the central stage for the city of Spokane's move to provide 24/7 shelter to anyone who needed it. Suddenly, it wasn't 100 or so men sleeping at the shelter every night, but more like 300 men and women, there at all hours of the day. Like before, many suffered from mental illness or drug addiction. For Padrta and other nearby business owners, the increased numbers have been a major blow. The majority of House of Charity's patrons are kind and respectful, Padrta says, but the exceptions have created massive challenges. "They don't have enough staff to control what's going on. There's ambulances. There's police cars," Padrta says. "There's fights breaking out in the street." Her lights were broken. Her door was repeatedly kicked by an angry man apparently on drugs — until nearby House of Charity patrons chased him down. She laments loiterers sleeping on her steps, urinating on her front door and defecating behind her fence or in her flowerpots. "They have no problem with leaning against your building and shooting up heroin," Padrta says. She's part of the Gateway Business District, a coalition of about 10 local business and property owners, including Urbanna and the Froyo Earth frozen yogurt shop. Over the past year, the neighboring businesses' frustrations have sparked several meetings — sometimes heated — between downtown businesses, social services and the city. While Catholic Charities has spent more than $200,000 to try to respond to the businesses' concerns, the tension has underscored the tricky balancing act between creating an urban core filled with thriving local businesses and one filled with social services helping the neediest. Catholic Charities' Rob McCann, the organization which runs House of Charity, declined to be interviewed for this story, worried it would only serve to further vilify the homeless. Instead, he sent over a statement he provided to the Catholic Charities board of directors and the Bishop of Spokane's Roman Catholic diocese. McCann points out several reasons the homeless have been driven to the area. Riverfront Park has been closed for construction. The city has been breaking up homeless encampments along the Spokane River and putting up "No Camping" signs in their place. When the city of Spokane placed $150,000 worth of basalt boulders underneath I-90 near Bernard Street — partly in order to push out a homeless encampment — it drove those campers toward the House of Charity. As a result, McCann writes, "the activity at House of Charity and on our block has certainly grown exponentially." Cassel Promotions & Signs was on the corner of Division and Pacific even before House of Charity opened. So the brothers who own the business, Sam and Tracy Cassel, have been in downtown for decades — and suggest it's never been this challenging. "The graffiti. The human waste," says Tracy Cassel. "The amount of garbage on a daily basis is unbelievable." He estimates his business spends at least an hour or two a day cleaning garbage or handling other issues related to loiterers or troublemakers. Then there was the guy who'd been kicked out of the House of Charity and was swinging a baseball bat and screaming at customers. "Some of them wave to you and you wave back," Tracy Cassel says about the people who hang out near his business. "And some of them yell and scream at you, and they threaten you." While the vast majority of the people loitering near Cassel Promotions or Bridge Press Cellars are harmless, even the perception of danger can turn away customers. Padrta says her customers worry about parking on Pacific. The Cassels say their foot traffic has dwindled to almost nothing. "We have been told by many of our customers that they won't come down here any more," Sam Cassel says. He recalls one customer who refused to send his wife down to pick up an order because he was worried about the loiterers nearby. Shawna Sampson, homeless services operations coordinator for Spokane Neighborhood Action Partners, says that SNAP has seen more incidents crop up near its offices as well. But she also believes Spokane needs to change the way it sees the homeless. "I wish that people were more tolerant of poverty and of homelessness and mental health issues and all of those things," Sampson says. "Some people need to realize that Spokane is not going to be Pleasantville." In addition to the shelter, 150 units of housing for the formerly homeless have been constructed by Catholic Charities and Volunteers of America in the surrounding area, and an additional 50 units are opening soon. In a January interview, McCann acknowledged that he probably wouldn't like to live next to one of these units. "I do get phone calls at 2 in the morning because something happens in one of these apartments," McCann told the Inlander at the time. "We do have 50 people who are suffering from mental illness and substance abuse issues... If you're a neighbor, that's a hard one." But long-term, he says, the goal is to provide housing to reduce the effects of homelessness on the community. Indeed, the Cassels have some praise for those staying in apartments for the formerly homeless. Tracy Cassel notes he often spots them picking up trash and putting it in garbage cans. "A lot of the people that live around here, they're our neighbors now," he says. "They even complain about the litter and things like that." McCann notes that the Catholic Charities has, time and time again, tried to respond to business concerns by providing more and better cameras, and more staff to constantly clean the block. They've hired security officers trained to help people suffering from drug addiction and mental illness. They've provided businesses with a phone number to report problems and have staff responding within 90 seconds. But it's tough. "We can clean the entire block spotless and move all the loitering folks and sleeping folks out, and 10 minutes later it can be completely filled and trashed again," McCann writes. "It's the reality of the suffering our homeless brothers and sisters face every day." Dawn Kinder, Spokane's director of housing and human services, says that the city has upgraded lighting and added more trash cans in the area. The police have also been doing more foot patrols around the shelter. Long-term, Kinder says, Spokane is looking to add another 24/7 homeless shelter elsewhere in the city to reduce the burden on House of Charity. One one hand, Sampson says, there can be an advantage to a concentration of services. "It's very difficult to get your needs met, if where you're staying is so far way from other resources," she says. 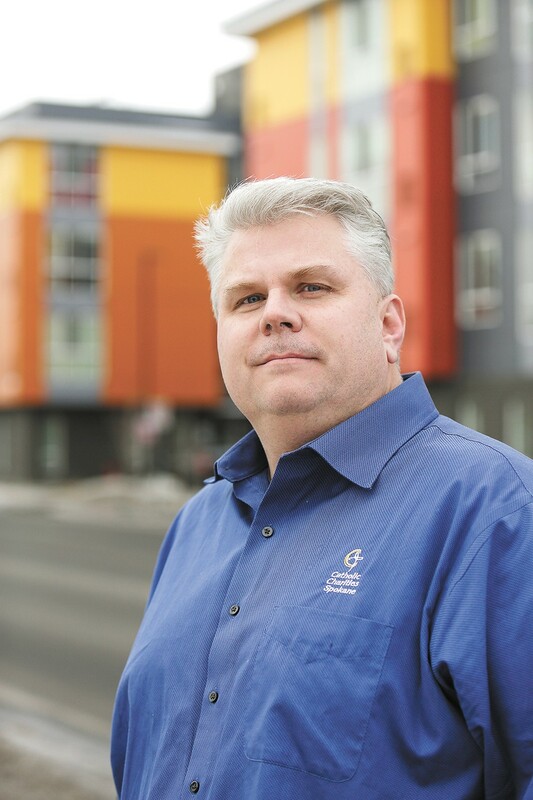 But Mark Richard, president of the business alliance Downtown Spokane Partnership, says that downtown can't shoulder the entire burden of helping the homeless — the rest of the community needs to help, too. "The concentration of individuals that are most vulnerable has not only proven to be a bad idea for businesses and for a neighborhood, but it's a horrible idea for the person in need," says Richard. Padrta says she appreciates all the efforts of Catholic Charities to respond to her concerns, but she's still hoping for additional changes. She says Catholic Charities has discussed enclosing the House of Charity parking lot to provide a separate waiting area for its clients, or moving the entrance to the east side. She cares about the homeless, she stresses.